Oxford Properties Group Inc., the real estate arm of the Ontario Municipal Employee Retirement System, recently announced plans to build new apartment buildings. Economic feasibility of new construction has become more favourable with the forecast of higher rents and lower operating costs. Such new construction will principally occur within the central districts of larger urban cities. Economists and developers have talked a lot about densification or “Urban Light”‐ denser suburbs that revolve around a walkable town centre. 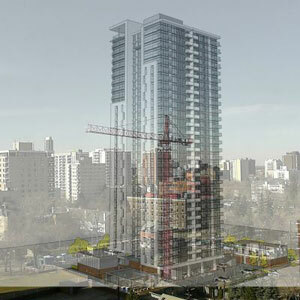 This is occurring right here in Edmonton, in addition to substantial suburban development, primarily in the form of wood‐frame walk‐up apartment buildings; new high‐rise rental development is taking shape downtown. Traditional high‐rise condominium development continues; however, there are three new high-rise projects currently under construction that are to be pure rental projects. Additional projects are in the planning stage, but construction has yet to be initiated. Demand for new product has been positive, with lower vacancy and increasing rents from existing inventory, which is substantially older (1970s to early 1980s construction), with dated finishing, floor plans, and with limited amenities. Where is the demand coming from? An expensive housing market? Who are the renters? Could it be a changing demographic? A growing demographic has been the rapid rise of the “Millennials” (Generation Y) and the increasing populace of older workers and/or retirees as a result of the aging “Baby Boomers” generation. Based on a publication by Forbes, Millennials are described as falling within the age group of 19‐36 and are suggested to represent the largest generation in the United States. What is distinctly different about this generation are their values and attitudes. This generation has been shaped by the technological revolution and they are linked to their gadgets (cellphones, laptops and lately, tablets); they are continually on‐line/communicating and are very connected. Many Millennials grew up watching their Baby Boomer parents working long hours at stressful corporate jobs, which has had an impact on their own views on the workforce and the preference for work‐life balance. In essence, Millennials are focused on amassing life experiences rather than on tangible objects. For a living environment, they are seeking the cool, urban neighbourhoods with favourable walkability. In addition to housing, this generation also lacks interest automobile ownership. Most of the new high‐rise developments have immediate access to transit, commonly referred to as “TOD” sites (Transit Oriented Development). Further, our city now has a car‐sharing service called “Pogo”, which is similar to the Car2Go service that has been operating in Calgary. Simply put, customers sign up for a membership, find a GPS‐located car using either the website or a smartphone app, and accesses the car with a supplied key fob. The user pays for the usage by the minute, and finally leaves the car where they drive to, as long as it is located within the service area. What about retirees/seniors, another significant growing segment of our general populace? A significant portion of this generation’s net worth is represented by the equity in their principal residence. Across Canada, (including Edmonton), the inflationary growth in housing prices has been extraordinary; tapping in on this wealth will inevitably result in the sale of their homes. Traditional downsizing to condominiums has become increasingly expensive with regard to the purchase or equity contribution, and associated costs condo fees. Further, is the relative simplicity of renting in contrast to the responsibility (fiscal and otherwise) inherent of ownership? Simply put, in the context of a $500,000 to $1 million nest egg, a gross annual expense of $24,000 for a favourable living accommodation may well be a practical alternative. Some visionary developers have acknowledged this phenomenon and are providing amenities in their buildings that will cater to this growing populace. Finally, there may be a certain segment of the population that prefer “Rental Living as a Choice”. Ultimately, it is the general thought the growth of these two generations will fuel new rental development. So is Edmonton ready for a substantial infusion of modern rental product? It would seem so. This article was contributed to Property Biz Canada by Brent Blake, AACI, Licensed Real Estate Appraiser, Senior Director, Research, Valuation & Advisory, Altus Group Limited.